Redux (formerly Ripplegroove) is so prone to change, that even their name isn't sacred. Since 2001 the band has gone through four personnel line-ups, three hometowns, and three names. Recently, Redux found themselves in their most extreme state of renewal yet. 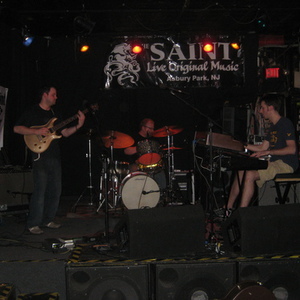 One year after the release of their debut record Under The Microscope (2006) reached #14 on the CMJ Jazz Charts and #9 on Jambands.com Top 40, Redux found themselves living on the other side of the country without a drummer. "We lost Jed, our drummer of four years. At the same time, we find ourselves in a brand new city, with a totally new music scene and a very different overall mentality," says guitarist Tom Burda. "And believe me, New York City is a far cry from San Diego in every way imaginable." So Tom and Joe Hanley (keyboards), scoured New York for the right drummer. As luck would have it, of all the drummers auditioned, the very first one they met would be the guy they'd end up with. RJ Rabin is the newest member of Redux and has brought with him an influence of change much welcomed by the other members. "I could show you a big list of reasons why RJ was the right choice. But what it really comes down to is, that it just felt great to play with him," says Joe. "It clicked right away. I just knew." With a simpler, bigger sound and a deeper pocket, the addition of RJ would be change enough. But Redux is adding yet another big addition: a bassist. This will not only free up Joe's left hand from bass duties, but it will create and even bigger, deeper, steadier pocket. Right now, they're hard at work in RJ's Green Room, writing, playing and recording new music. Upcoming Performances will soon be an eclectic mix of the instrumentals off Under The Microscope that fans know and love, along with new tunes, both vocal and instrumental. And of course, a second album is in the works. Throughout all of this change, Redux has never lost focus of their personal and singular vision of sound and style they have strived to create. Josh Klemons of Jambase.com put it best when he described Redux as a band "that is already comfortable enough with its sound to not only think outside the box, but to open it up and take a walk around, all the while remembering where they are coming from and what they are trying to say, both to each other, and to those of us who have chosen to tap in."